Just west of Rawlins, Wyoming is where most modern day travelers first cross the Continental Divide which stretches from Alaska’s Bering Strait in the Arctic Ocean to the Straits of Magellan off the southern tip of South America. It is a hydrological designation, where water flows west on one side and east on the other. Geologists believe rock outcroppings west of Rawlins cover a greater spread of time than any other between the two coasts, well over half the existence of the earth. This translates to twenty-six hundred years, ten times older than those exposed in the Grand Canyon. These outcroppings break like waves from the end of the Wind River Range, where all but one of my sixteen great-great grandparents banked southeast through a break in the Rockies on wagon trains in the late 1840s and early 1850s. Several were among the first Mormons along that route but by then 2,500 others had preceded them in what would become the western migration of some 300,000 who would follow. What distinguished my ancestors is that they stopped along the trail to make it easier for those who followed by building ferry crossings and supply depots. Half of my great-grandparents colonized settlements along mountains, framing each side of the Salt Lake and Utah valleys as well as west-central Nevada and northern and central Arizona. The other half turned north to settle Cache Valley where it straddles what is now the Utah and Idaho border before eventually migrating north to homestead and ranch the upper reaches of the Henry’s Fork along the Idaho side of the Tetons in a nook between Montana and Wyoming. The northern branches could have saved a lot of time if they had cut 200 miles northwest along the Wind River Range to Jackson Hole and then over the Tetons. Both areas were shown on maps and in pamphlets published by Congress a few years earlier to share the results of expeditions led by John C. Frémont. Frémont’s route up the Wind River Range and then across the Tetons to my homeland is one of my favorite drives. The iconic Tetons are only 40 miles long and less than ten miles wide. This is only 13 miles longer than the distance from my long-time home of Durham, North Carolina southeast to Raleigh and a width similar to the distance from Durham southwest to Chapel Hill. 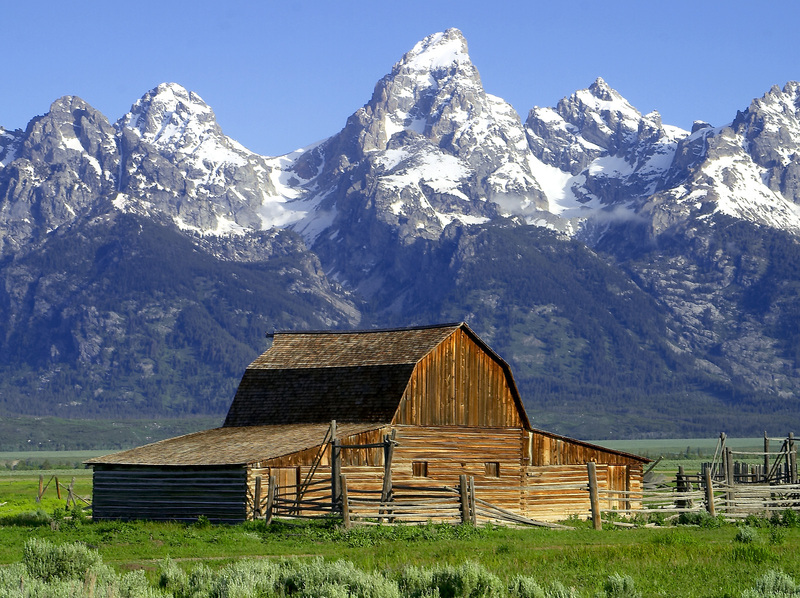 Yet the Tetons are not only the backdrop to my origins but by far the most frequently used image to symbolize the west. They are used more than any other backdrop, often shown on the horizon of movie depictions of the 1,500 mile route my ancestors took west as the great migration began. Several ancestors, I have learned doing family history research, became interpreters to various nations of Native Americans along the route, including the Shoshone, who are believed to have evolved from solitary family units to bands when they moved to horseback by 1700. Having traded with Spanish explorers for their mounts, by 1700 they were trading with the Comanche near those ancient outcroppings. Then the Shoshone traded horses to other Shoshone in Cache Valley and north with the Bannock, a Paiute-speaking nation living among the Shoshone in what is now eastern Idaho. The Shoshone had also traded horses to the Blackfeet nation in Montana by 1751, a tribe that then used their mounts to drive the Shoshone back over the mountains framing the place of my birth in that nook of Idaho. By the time, my ancestors moved among the Shoshone as interpreters, the horse-mounted bands had extinguished vast Buffalo herds in eastern Idaho from that Teton nook down to Cache Valley. Trappers from the east often used the term “hole” to refer to a valley rimmed by mountains, e.g. Jackson Hole, Henry’s Hole and Pierre’s Hole. The term was picked up by outlaws, cattlemen and homesteaders. The forty-mile valleys on each side of the Tetons are remarkably flat in contrast to the explosive 7,000 foot sheerness of that range rising abruptly on each side from the valley floors, which are already a mile above sea level. On the Idaho side, the valley was leveled out by volcanic lava flows. On the Wyoming side, the valley was scoured flat by a glacier a half a mile thick. On the Idaho side, springs feed the North Fork of the Snake River. On the Wyoming side, they feed the South Fork. Together the two forks join downstream to form the powerful Snake River near Idaho Falls. Geologists, according to John McPhee in his book Rising from the Plains, believe that the Teton landscape provides not only the most complete geologic history in North America but the most complex. For me, they symbolize my roots. Along with Mt. McKinley, which I could view from my office in Anchorage, Monument Valley and the Grand Canyon, the Tetons are known as America’s scenic climax. To me, they symbolize my beginning. Enjoyed the post. We share a connection in geographical family history, from Cache Valley and Teton Valley. Thankfully I call Teton Valley my home. Born and raised. I never tire of the beauty that surrounds this area.